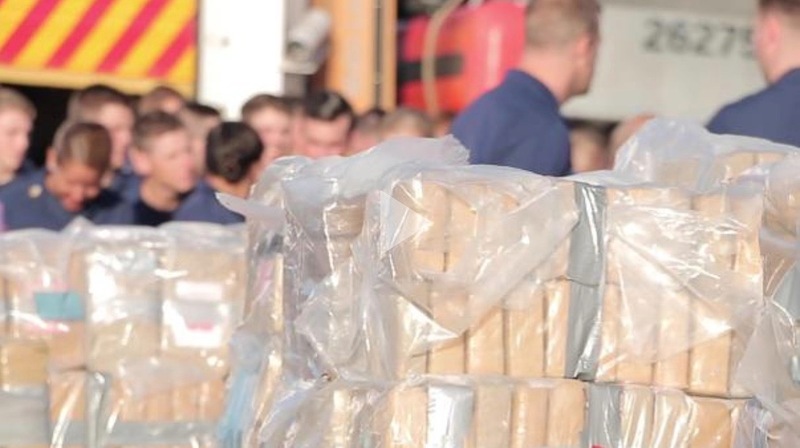 MIAMI — The crew of the Coast Guard Cutter Forward (WMEC-911) offloaded approximately 34,780 pounds of cocaine Tuesday in Port Everglades worth an estimated $466 million wholesale seized in international waters in the Eastern Pacific Ocean. The cutter Forward was responsible for eight cases seizing an estimated 14,207 pounds of cocaine. The Coast Guard Cutter Hamilton (WMSL-753) was responsible for five cases, seizing an estimated 9,460 pounds of cocaine. The Coast Guard Cutter Campbell (WMEC-909) was responsible for four cases, seizing an estimated 6,153 pounds of cocaine. The Coast Guard Cutter Alert (WMEC-630) was responsible for two cases, seizing an estimated 5,736 pounds of cocaine. The Coast Guard Cutter Venturous (WMEC-625) was responsible for one case, seizing an estimated 1,565 pounds of cocaine. The Coast Guard Cutter Confidence (WMEC-619) was responsible for one case seizing an estimated 553 pounds of cocaine. "The interdiction and disruption of more than 17 tons of cocaine is a result of the collaboration and coordination of multiple Coast Guard and interagency assets to address the complex maritime challenge of transnational criminal organizations,” said Cmdr. Michael Sharp, commanding officer of the cutter Forward. “I am extremely proud of all the women and men that contributed to the mission success, it is a direct reflection of how the U.S. Coast Guard delivers mission excellence anytime, anywhere." Numerous U.S. agencies from the Departments of Defense, Justice and Homeland Security are involved in the effort to combat transnational organized crime. The Coast Guard, Navy, Customs and Border Protection, FBI, Drug Enforcement Administration, and Immigration and Customs Enforcement along with allied and international partner agencies play a role in counter-drug operations. The fight against transnational organized crime networks in the Eastern Pacific requires unity of effort in all phases from detection, monitoring and interdictions, to prosecutions by U.S. Attorneys in Florida, California, New York, the Gulf Coast, Puerto Rico, and elsewhere. The Coast Guard increased U.S. and allied presence in the Eastern Pacific Ocean and Caribbean Basin, which are known drug transit zones off of Central and South America, as part of its Western Hemisphere Strategy. During at-sea interdictions in international waters, a suspect vessel is initially located and tracked by allied, military or law enforcement personnel. The interdictions, including the actual boarding, are led and conducted by U.S. Coast Guardsmen. The law enforcement phase of counter-smuggling operations in the Eastern Pacific are conducted under the authority of the Coast Guard 11th District headquartered in Alameda, California. The cutter Forward is a 270-foot medium endurance cutter homeported in Portsmouth, Virginia. The cutter Hamilton is a 418-foot national security cutter homeported in Charleston, South Carolina. The cutter Campbell is a 270-foot medium endurance cutter homeported in Portsmouth, New Hampshire. The cutter Alert is a 210-foot medium endurance cutter homeported in Astoria, Oregon. The cutter Venturous is a 210-foot medium endurance cutter homeported in St. Petersburg, Florida. The cutter Confidence is a 210-foot medium endurance cutter homeported in Port Canaveral, Florida.